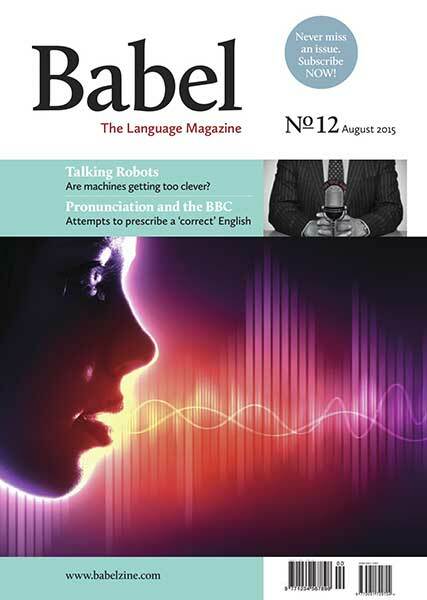 Babel Magazine Babel - Issue 12 Babel No12 (August 2015) Articles British and American English - Jeremy Butterfield investigates how British and American English differ The Early BBC on the Question of Pronunciation - Jurg Schwyter describes the BBC's attempts to prescribe how English should be spoken Description Vs. Prescription - Dan McIntyre on attitudes to how language is used Talking Robots - Georgina Brown looks at Speech Technology applications What's in a Name? - Sarah Chevalier explores the associations attached to given names • UK Delivery including postage £7.00 • Europe Delivery including postage £10.00 • Rest of the World Delivery, including postage £12.00 Please select the number of copies required and your geographical location below to add to your shopping cart.